Mon-Sat peaks and Sun pm journeys extended from Hornchurch Station to Hacton Drive. Mon-Fri/Sun RD allocation transferred to North Street (NS). Forest Gate (G) garage closed - allocation transferred to North Street (NS). RT2776 easily identified by the ventilation grills - fitted for a USA tour. Withdrawn section covered by New Route 294 Collier Row & Hornchurch. Converted from Daimler Fleetline operation to Leyland Titan operation. 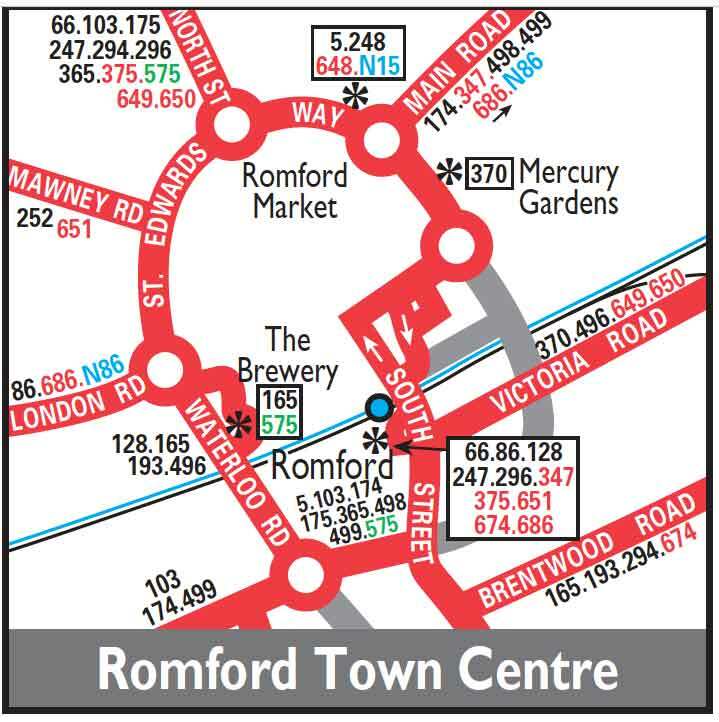 Withdrawn between Romford and Harold Wood except for Route to Gidea Park at above times. Withdrawn section covered by new 296 Romford and Harold Wood. Withdrawn between Romford and Gidea Park. Sunday converted to part midibus operation. Operation transferred to County Bus operating from Debden base. New contract commenced with Arriva Southend - operating from their Grays garage with10.8M E200 BUSES. At Redbridge Station - eastbound buses to operate direct from roundabout to Eastern Avenue instead of via Station forecourt. Changeover point was Wanstead (The Green). Changeover point was Hornchurch Town Centre ?